Publication : Botanico Italiano Vol. 19, 1987. Fernando Tammaro and Loretta Pace, Informatore. "Il genere Pinguicula L. (Lentibulariaceae) in Italia Centrale ed instituzione di una nuova specie P. fiorii. Tamm et Pace"
Perennial plant with a winter hibernacula, short rhizome and filiform roots. Leaves 7 - 8 in a basal rosette, an entire margin, very revolute, to cover 1/5 of the entire leaf lamina, hairless below, glandular and sticky above, bright green colour. Broadly ovate, length (20) 24 - 27 (32) mm, width (9) 9.5 - 12 (16) mm. Flower scape 1 - 2, glabrous or glandular at the base, densely glandular at the apex, 50 - 75 mm tall, single flowered. 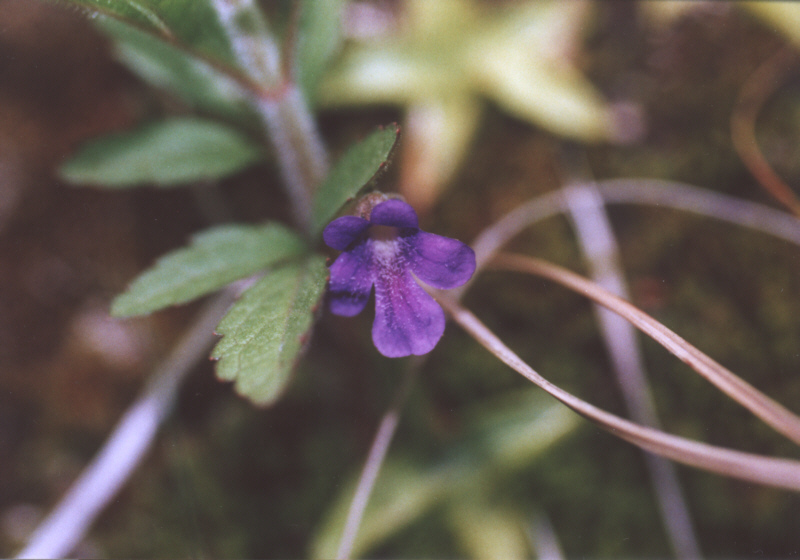 Flower bilobes, 15 - 20mm long, azure-violet, calyx bilobed, glandular; superior calyx lobe trilobed, largely oval, with rounded apex; short, nearly as long as wide; inferior lobe bilobed, the division ending 1/3 from the base. Corolla length 15 - 20 mm, bilobed, the throat hirsute with white multicellular hairs, which are smaller around the base of superior than on the inferior lobe; inferior lobe trilobed, rounded-oblong, overlapping at the edges. Spur straight, blunt, diameter 4.5 - 5.5 (7.5) mm, about 1/3 of the corolla. Capsule ovoid, subequal to the calyx. 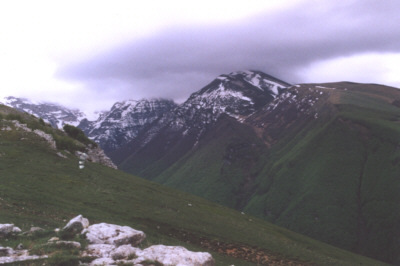 The species was discovered in Italy, in the Majella mountains and described in 1987. 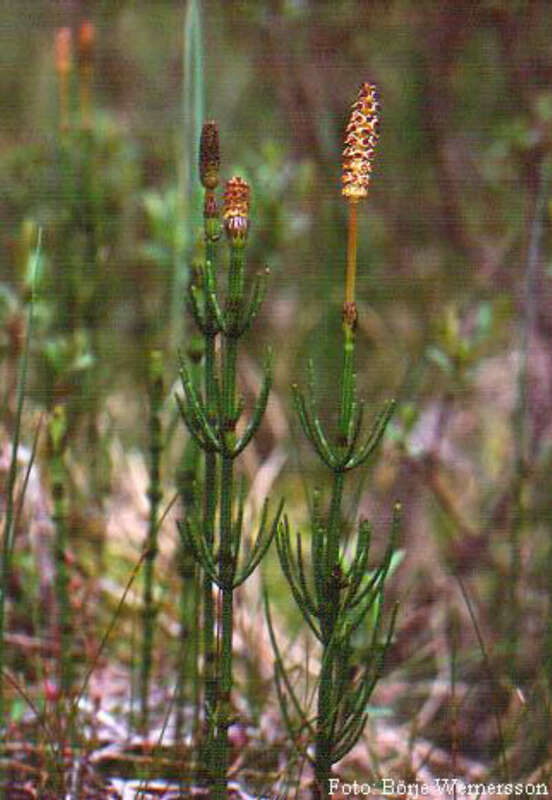 There was a controversy on the fact that these plants were a new species or not. 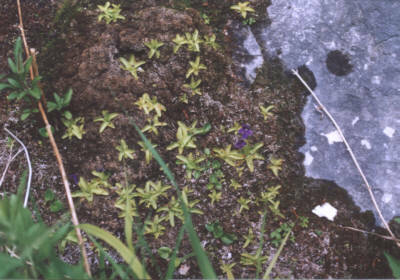 In Casper (1962), these plants were identified as Pinguicula balcanica. Jurg Steiger think that in spite of the relatively poor description and illustration of this discovery it is certainly a distinct species. 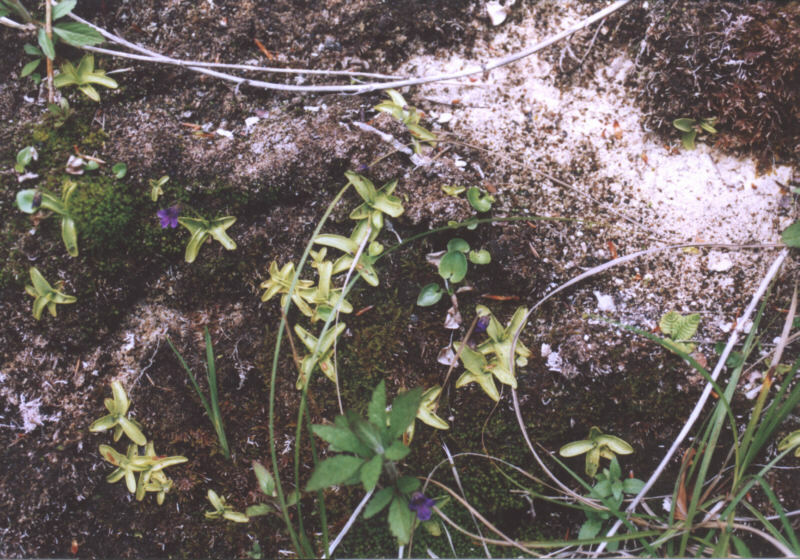 Pinguicula fiorii have been found in four locations up to now (2002), all in Majella, in Italy. Jan Flisek thinks that there are more sites hidden in the mountains but the terrain is very difficult and the plants are difficult to find. 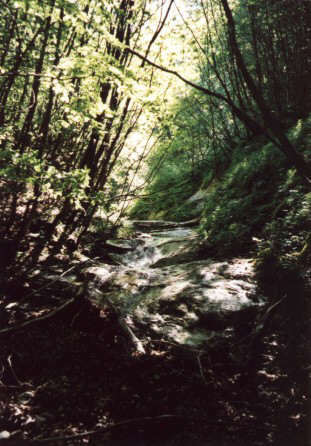 - Eastern slopes of the Majella, in the locality of Cannelluccia di Bocca di Valle in a gorge on mossy calcareous rocks with dripping water, 750m. 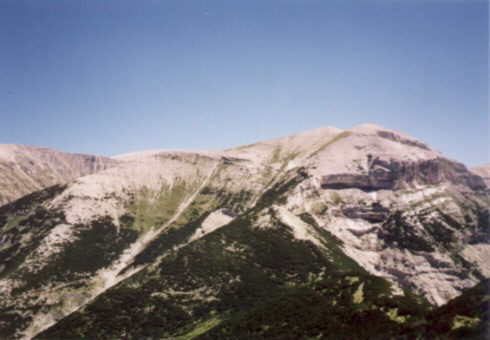 - West slopes of Majella, Valle dell'Orfento, Grotta di San Giovanni, 1300m. 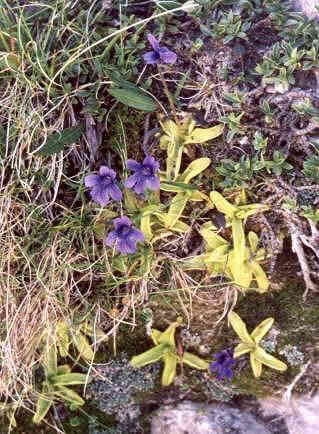 - The last site known is mentionned by Jurg Steiger in "Pinguicula (Lentibulariaceae) : The cool climate species of the northern hemisphere - Morphology, Biology, Cultivation" a text from the second conference of the International Carnivorous Plants Society, Bonn (Germany), May 30 - June 1st, 1998. The location is not cited but this is in the alpine zone. An altitude of 2460m is cited. 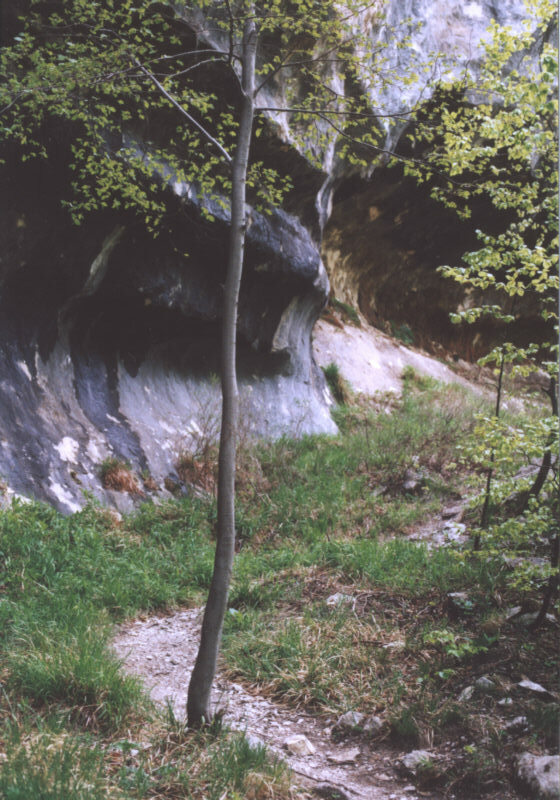 Jan Flisek visited this site, it is an alpine site. The plants on the alpine site are more smaller than the others. They are 3-6 cm in diameter. 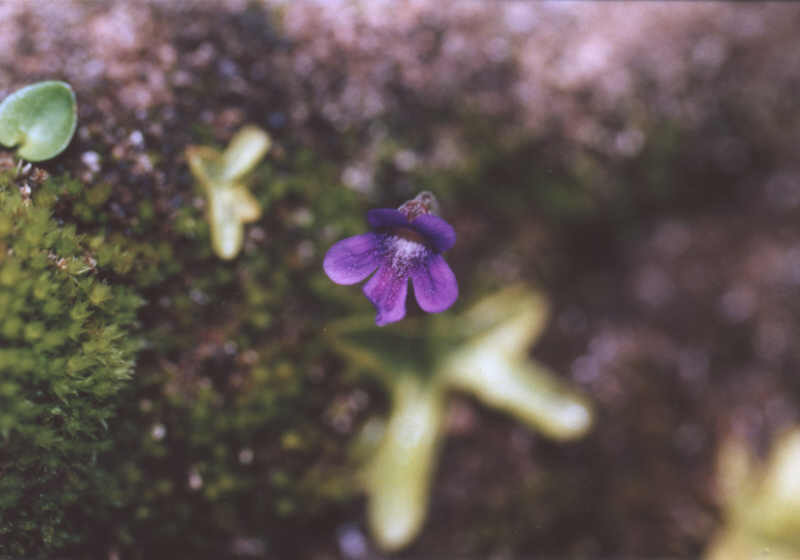 Pinguicula fiorii grows in gorges, in mossy carpets on rocks with dripping water surrounded by Fagetum (beech). Altitudes are from 750m to 2470m (Steiger - Bonn,1998). 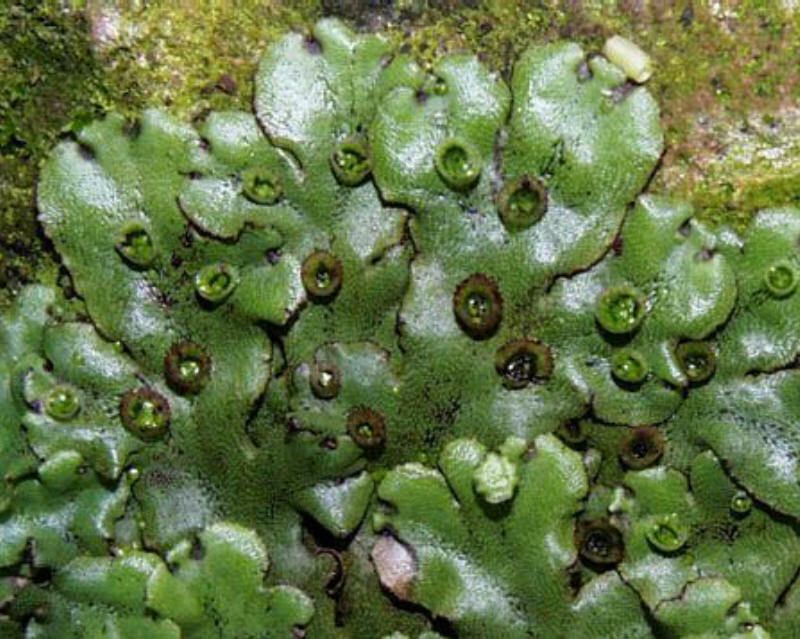 Others plants that grow with Pinguicula fiorii : Marchantia, Equisetum palustris, Parnasia palustris, Scrophularia nodosa, Angelica sylvestris. I don't know who was the first collector of Pinguicula fiorii for culture. 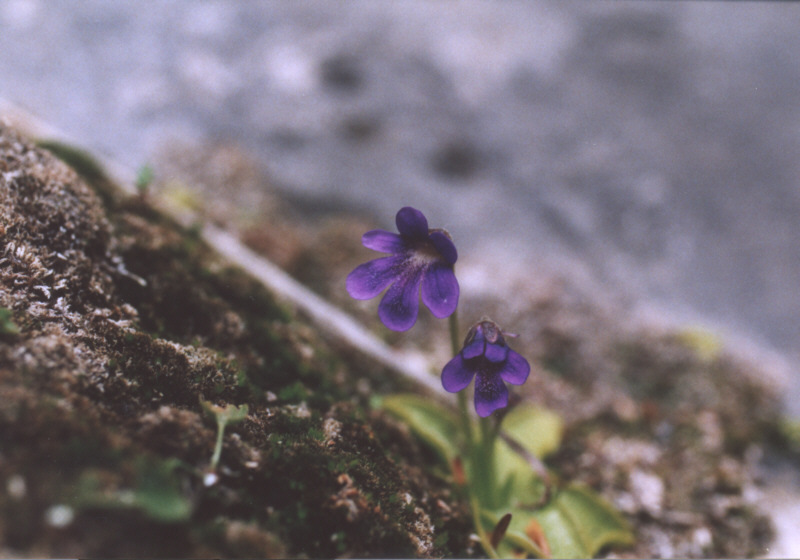 I was given my first Pinguicula fiorii in summer 1999 (an hibernacula) by Laurent Legendre. Unfortunately, this plant rot in winter 99. I bought then seeds in A. Lowrie catalogue in 2000 and get one small plantlet. This plantlet too rot in winter 2000. 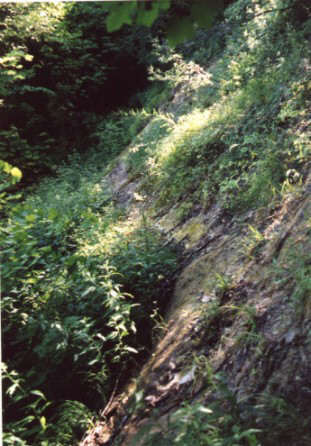 In 2001, Peter Harbarth gave me a big healthy hibernacula that I still grow in september 2002. Life cycle : In spring, the cycle begins by the opening of the winter buds and the production of the first carnivorous leaves. The first leaves are followed by the flowers in summer. 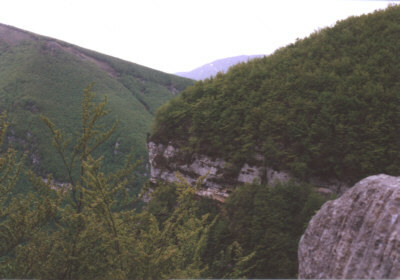 New carnivorous leaves are produced during all the season. Near autumn, or earlier, if your conditions are not optimal, the next hibernacula is revealed in the centre of the rosette. Then leaf production stops and the old leaves decay slowly. The plant (reduced now to a small hibernacula) is ready for winter and for the next cycle. Pot : big plastic box. I grow my plants in my garden all the year with a good amount of direct sun. 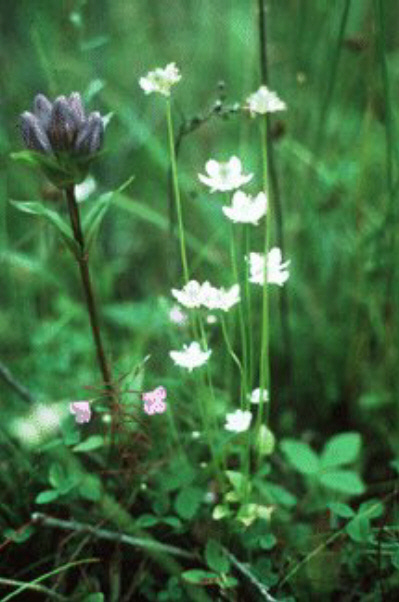 Multiplication : By seeds or using the gemmae produced around winter hibernacula. 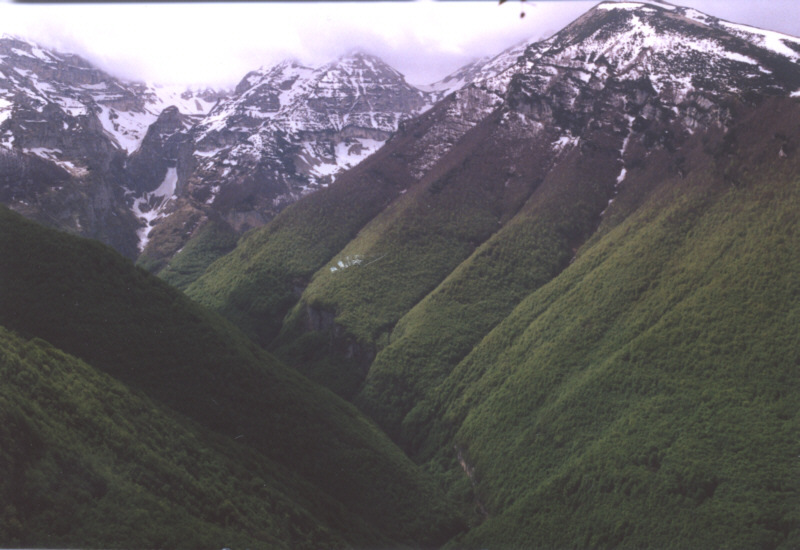 Valle dell'Orfento, Grotta di San Giovanni in our back. 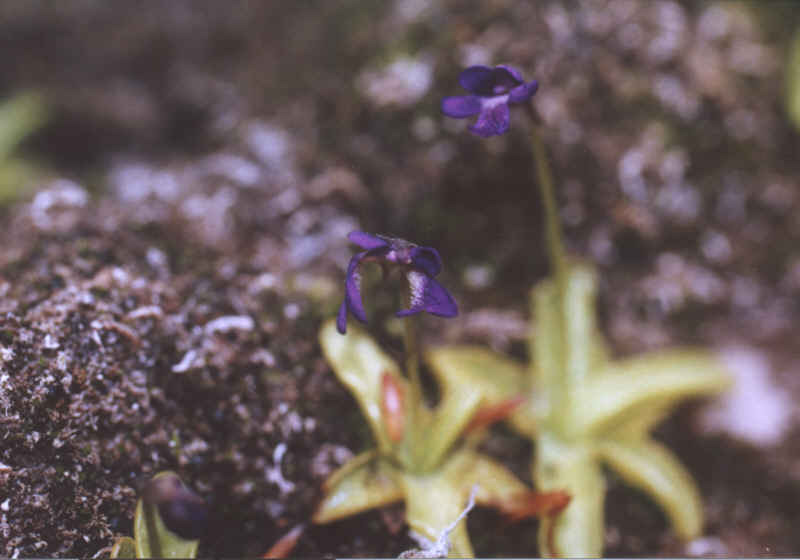 We are not far from the site of Pinguicula fiorii ! 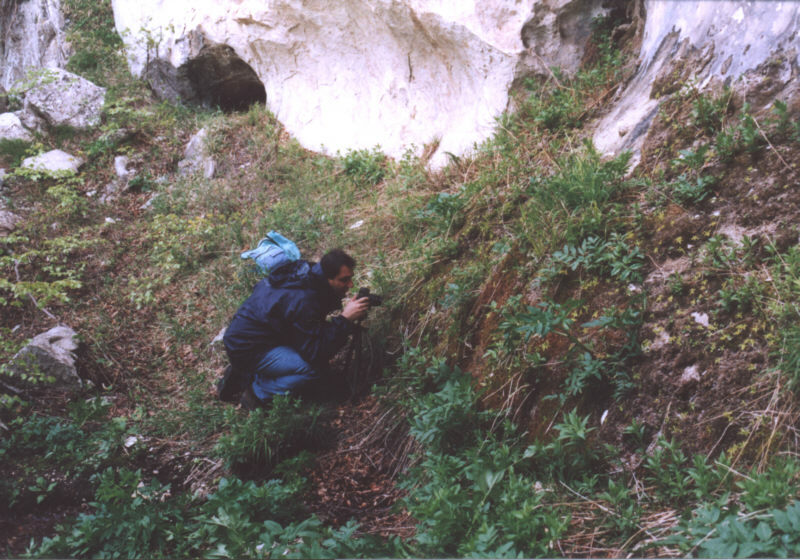 This is the beginning of the site of Pinguicula fiorii, Oliver Gluch was the first to take pictures. 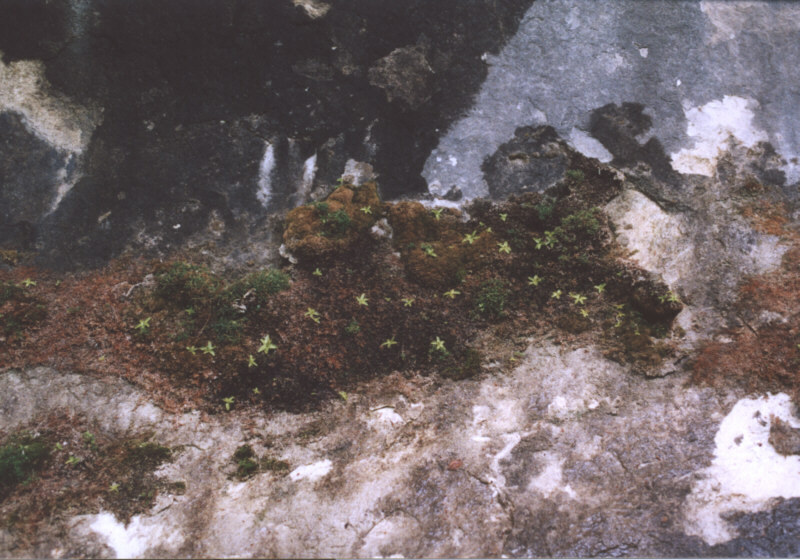 View of the site, plants are on wet moss all along the cliff. trees are Fagetum sp.. 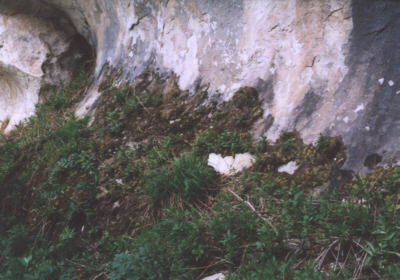 Still along the cliff, the black spots are made by dripping water along the cliff. Pinguicula fiorii only occured on the brown mossy cushion. Here is Pinguicula fiorii, some patch of moss (with plants) roll down to the bottom of the cliff and die. Numerous Pinguicula fiorii on mossy wet cushion. There were not a lot of flowering plants. 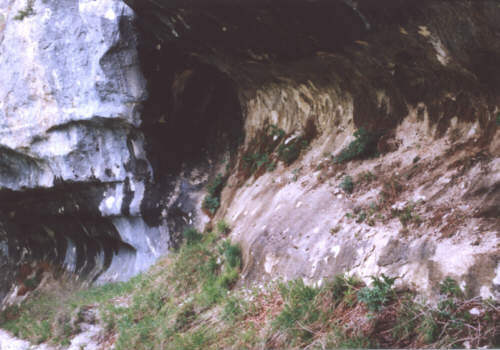 Under the moos, you can see the white calcareous substratum. Pinguicula fiorii in full bloom. Close-up of Pinguicula fiorii flower. Note the numerous white hairs and the forma of the corolla. Other close-up of Pinguicula fiorii flower. Spidery flower !. We noted that many plants were infested by aphids. Pinguicula fiorii with a flower with 6 corolla lobes. Valle dell'Orfento : this is the lowest known habitat up to now (2002) of Pinguicula fiorii. 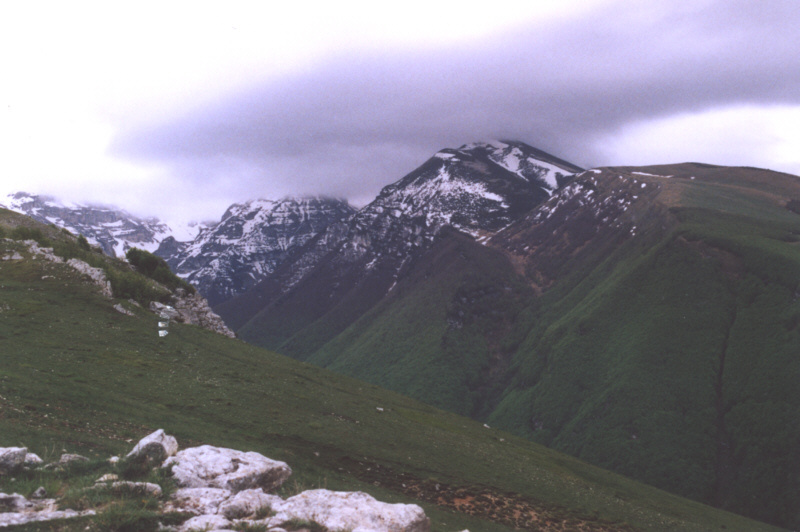 Mount Focalone : this is the highiest known alpine habitat up to now (2002) of Pinguicula fiorii. 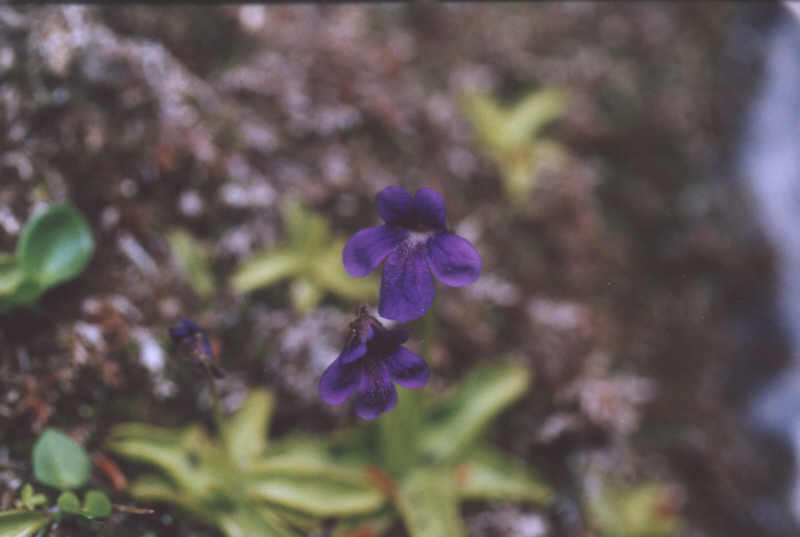 Pinguicula fiorii from the alpine site, with a flower with 6 corolla lobes. The plants are more smaller than the others (3-6 cm in diameter).